Some areas on the deck where lighting can be added. Here in the Phoenix Valley area, we are a bit of an oddity: while our eastern counterparts are huddled around their fires inside, we’re just as likely to be enjoying a party around the hot tub or the barbecue. But, the days are short in the wintertime, and it gets dark early. One of the hot new lighting trends for 2018 is deck lighting. Today, we’re going to show you some ideas which can light up your deck, so you don’t have to hold your hot tub party or barbecue in the dark. Stair lighting can be magical. Solar downlighting is popular because it doesn’t require wiring, a transformer, or any of the other trappings of regular outdoor lighting. Solar lighting is LED lighting, which means it is long-lasting. One should be aware, though, that even though solar would seem the obvious choice it has an unpleasant drawback: solar lighting will gradually lose brightness over time. LED lighting which is not solar can be battery powered, but they can’t be put on a timer or switch, and therefore have to be individually turned on (and off!) each time you use them. Low-voltage lighting is the one both electricians and landscape professionals prefer, as it offers a brighter option, which is a consideration if you have security concerns. It’s also a better option in areas where a few dismal days would leave solar lighting dim and inadequate. Behind the scenes: how the magic happens and protects the wiring. 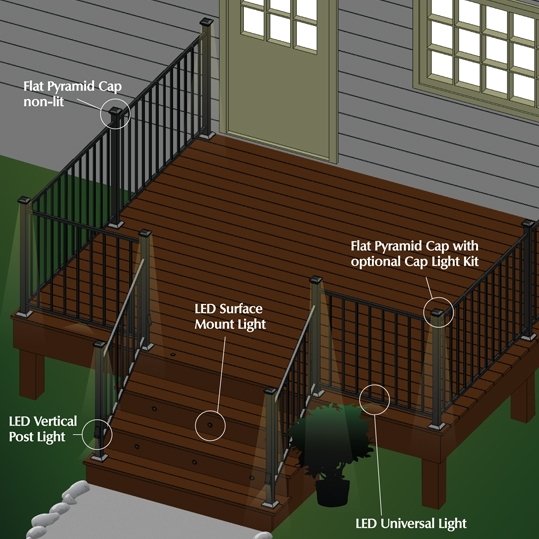 While deck lights may seem to be primarily about safety and security (and they are), they also create a lovely ambiance, which is where cap lights and step lights come in. Homeowners like these, especially downlighting, because in the middle of bug season, the bugs aren’t swarming up around your guests' heads. Step lighting can be recessed, which is a little more effort, but well worth it, thanks to the look of the finished product. The area surrounding a hot tub should be safe in the evening. Most hot tubs have lighting, right? They often have that ethereal blue glow they share with pools. That lighting is great at night when you’re in the hot tub or spa, but as soon as you get out, a little additional light is incredibly helpful, especially around stairs and rails. When you have a grill on your deck, it isn’t enough to merely be able to see the food as it cooks. Deck lighting will offer your guests the chance to move freely without the fear of a nasty fall. If your deck has a barbecue, don't leave guests in the dark! 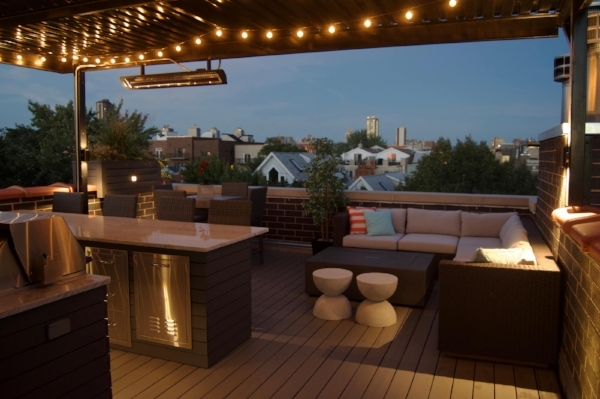 One of the most fortunate aspects of planning the deck lighting is that it gives you the chance to address hazards specific to your deck areas with appropriate light. As fundamental as this would seem to be, some homeowners don’t consider it until after there has been a mishap. Deck lighting may require protection from the elements, for example, the rain and wind. Solar lighting, which has no wiring, will be fine, but other lights should be protected, either by their location on the deck or by light shields. If you need a fast, affordable electrician to install deck lighting or for any other electrical need in your Phoenix home or business, call RSB Electrical at 480-485-4284.